Having a great looking garden that you and your friends can enjoy means having superb quality paving for patios, paths and other areas. At Davies DIY & Builders Merchant we have a fantastic variety of concrete paving and natural stone/slate in our Garden Landscaping section with a huge choice of shapes, sizes, textures and colours. 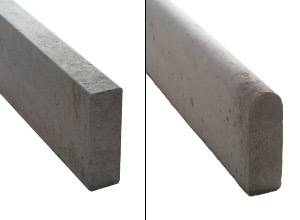 We also manufacture a massive range of wall coping, pillar caps, path edging and other concrete products, as well as items produce by some of the top manufactures in concrete products. Rope Top Edging is an authentically reproduced Antique rope edging which suits traditional tastes. It is specially treated to replicate a 'glazed' clay look. These edgings are ideal for adding the finishing touch to your patio, pathway or flower bed. Measuring 600mm in length x 150mm in height, the edgings are available in various colours. Scalloped edging is an easy way of finishing off a contemporary garden in style. Available in a variety of colours and 600mm in length, scalloped edging is the perfect accompaniment to many of our modern garden landscaping products.